Spring wildflower season is underway and it's time (again) for me to make a correction. Get out your copy of "A Naturalist's Guide to Sabino Canyon" (if you don't have one, never fear! You can get the updated and expanded edition in 2012) and turn to page 52. Cross out, put a sticker over, or otherwise delete the photo on the upper left labeled 'DesertChicoryNH'. Cross out (etc.) the description below it (NOT next to it) for TACKSTEM. We don't have those in Sabino Canyon. Finally, re-label the photo 'TackstemAG' as 'DesertChicoryAG'. 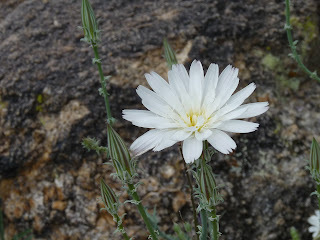 You will be left with a description for DESERT CHICORY on the upper right; and below it a re-labeled photo of that flower. Many thanks to Joan Tedford for this correction. I am AG and I approve of this message!